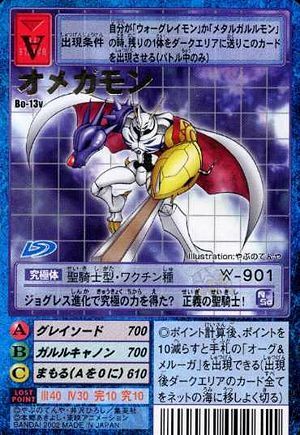 Battle Type Appearance Requirements When your Digimon is a War Greymon or Metal Garurumon, send the other card to the Dark Area and make this card appear (during battle only). After point calculation, you may reduce your points by 10 and make the card 'Warg and Melga' appear from your hand (after appearance, move all the cards in your Dark Area to your Net Ocean and shuffle it). This page was last modified on 3 December 2016, at 21:12.